Increasing awareness of bioeffects and toxicity of nanomaterials interacting with cells puts in focus the mechanisms by which nanomaterials can cross lipid membranes. Apart from well-discussed energy-dependent endocytosis for large objects and passive diffusion through membranes by solute molecules, there can exist other transport mechanisms based on physical principles. Based on this hypothesis, the team of theoretical physics at Universitat Rovira i Virgili in Tarragona, led by Dr. Vladimir Baulin, designed a research project to investigate the interaction between nanotube and lipid membranes. 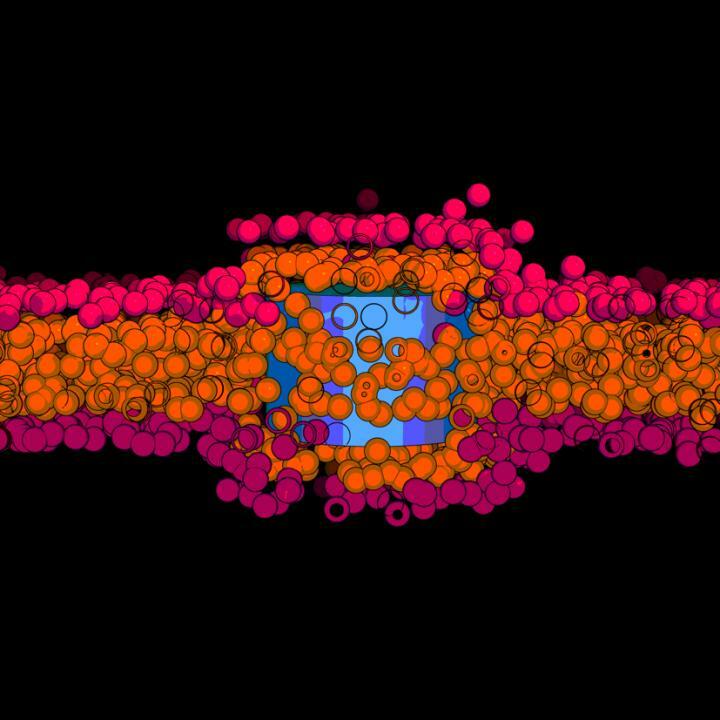 In computer simulations, the researchers studied what they call a “model bilayer”, composed only by one type of lipids. Based on their calculations, the team of Dr. Baulin observed that ultra -short nanotube (10nm length) can insert perpendicularly to the lipid bilayer core. They observed that these nanotubes stay trapped in the cell membrane, as commonly accepted by the scientific community. But a surprise appears when they stretched their model cell membrane, then inserted nanotubes which were trapped in the bilayer, suddenly started to escape from the bilayer on both sides. This means that it is possible to control the transport of nanomaterial across a cell membrane by tuning the membrane tension. This is where Dr. Baulin contacted Dr. Jean-Baptiste Fleury at the Saarland University (Germany) to confirm this mechanism and to study experimentally this tension-mediated transport phenomena. Dr. Fleury and his team, designed a microfluidic experiment with a well-controlled phospholipid bilayer, an experimental model for cell membranes and added ultra-small carbon nanotubes (10nm in length) in solution. The nanotubes had an adsorbed lipid monolayer that guarantees their stable dispersion and prevent their clustering. Using a combination of optical fluorescent microscopy and electrophysiological measurements, the team of Dr. Fleury could follow individual nanotube crossing a bilayer and unravel their pathway on a molecular level. And as predicted by the simulations, they observed that nanotubes inserted into the bilayer by dissolving their lipid coating into the artificial membrane. When a tension of 4mN/m was applied to the bilayer, nanotubes spontaneously escaped the bilayer just in few milliseconds, while at lower tensions nanotubes remain trapped inside the membrane. This discovery of translocation of tiny nanotubes through barriers protecting cells, i.e. lipid bilayer, may raise concerns about safety of nanomaterials for public health and suggest new mechanical mechanisms to control the drug delivery. Reference: Guo, Y.; Werner, M.; Seemann, R.; Baulin, V. A.; Fleury, J.-B. Tension-Induced Translocation of Ultra-Short Carbon Nanotube through a Phospholipid Bilayer. ACS Nano 2018. https://doi.org/10.1021/acsnano.8b04657.